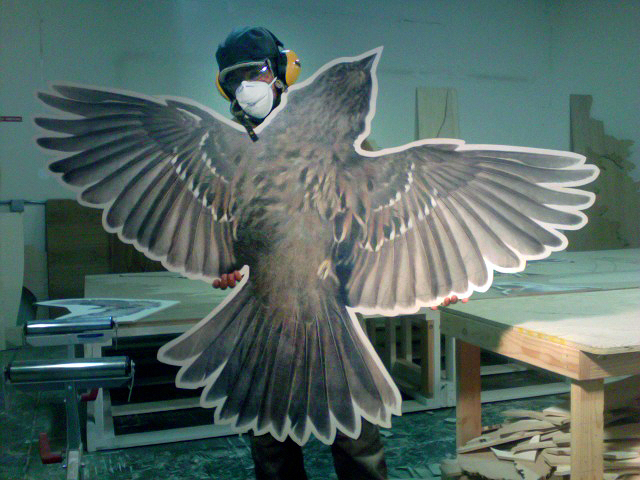 All the background pieces were ready and all the birds had been cut out. 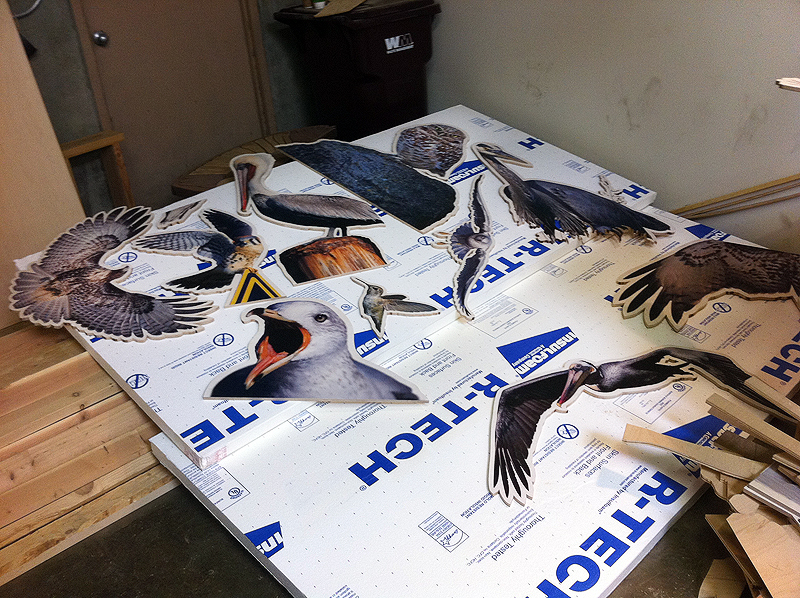 Now it was time to place all the birds and start the inlay process. I had to remove each background piece and cut it to accomodate the bird cutouts. 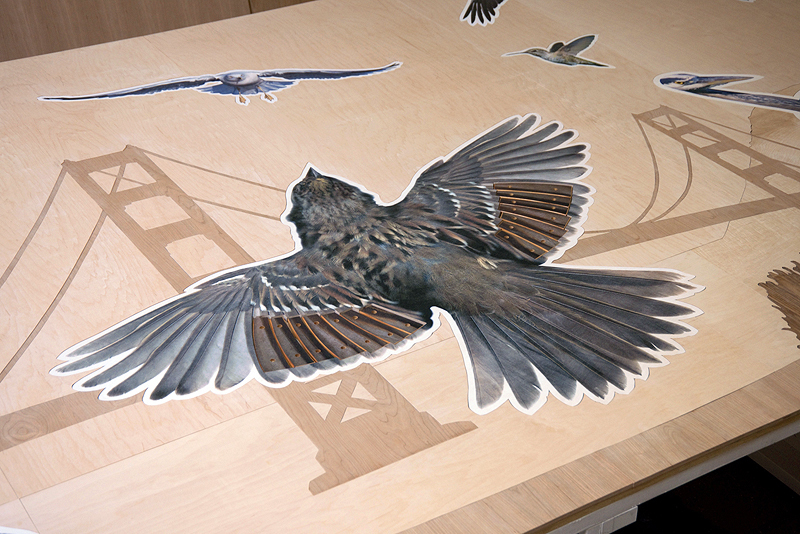 The sparrow finished and inlaid into the background. 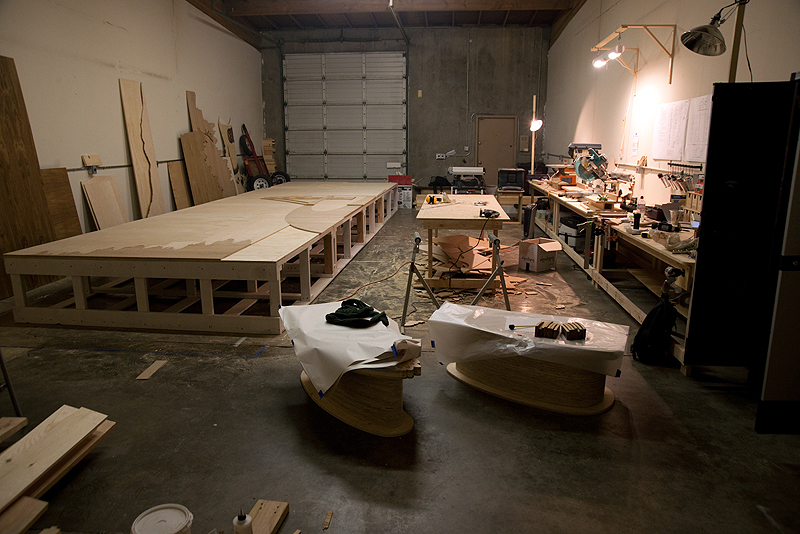 Working late nights in a cold studio wasn’t the healthiest way to go about it but the work needed to be done. 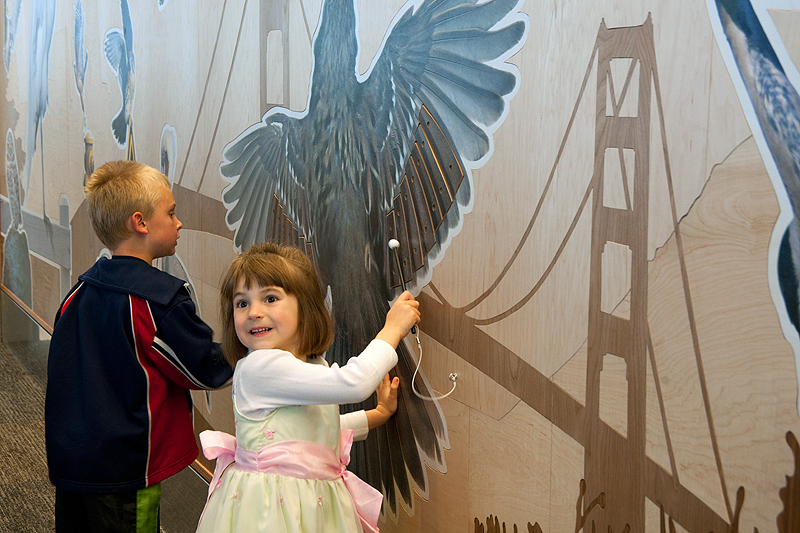 The birds had to have a protective clearcoat before getting permanently installed and they clustered together in a corner to dry. 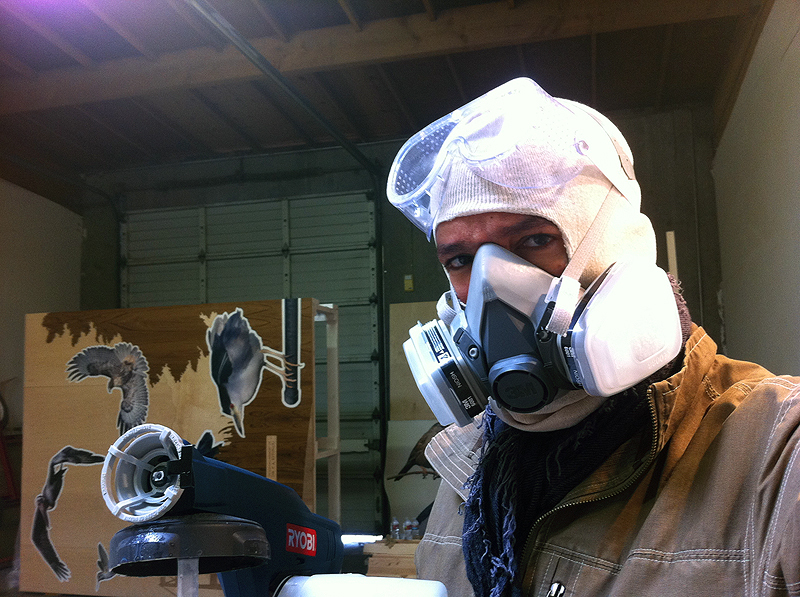 Finally the terrifying notion of spraying all my hard work with an unknown varnish and unknown spray gun came to pass. Luckily three coats went on clean and the finish turned out great. Moving day. 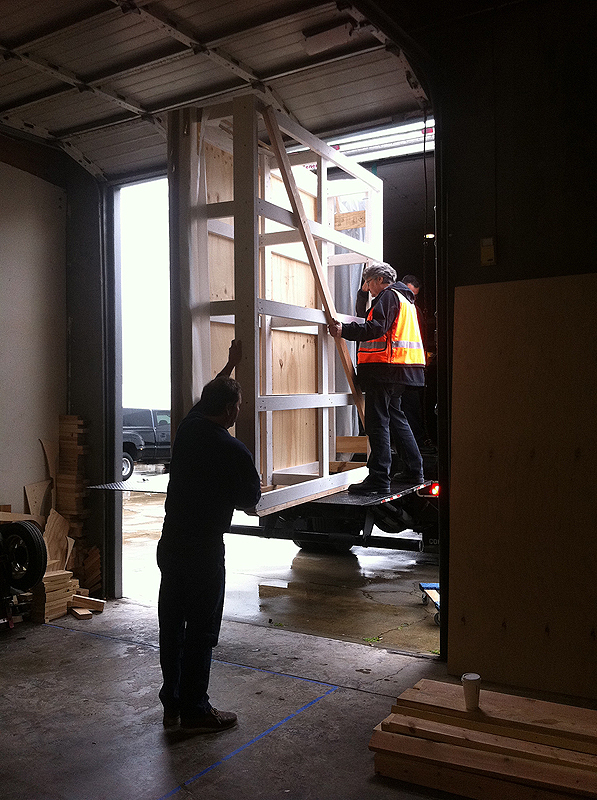 Shipping the mural sections to the airport. 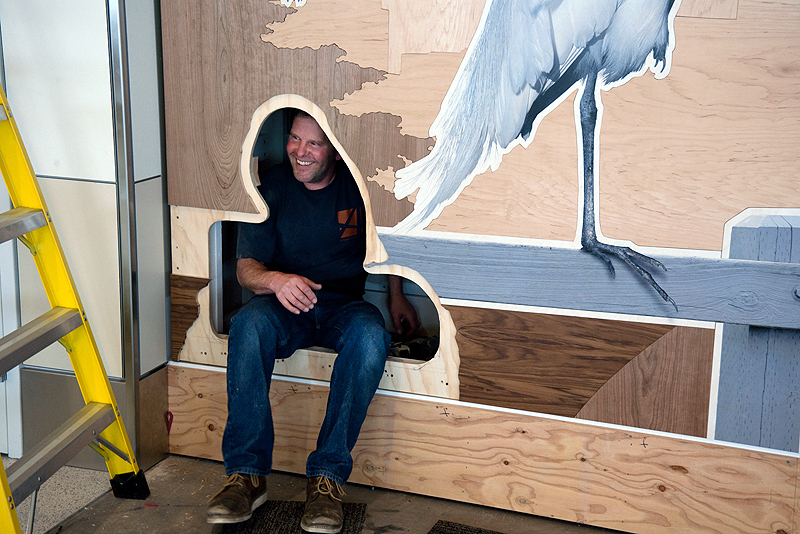 Installation was handled by some professional art installers who did the work but let me guide each step of the process. It fit together better than I had hoped. 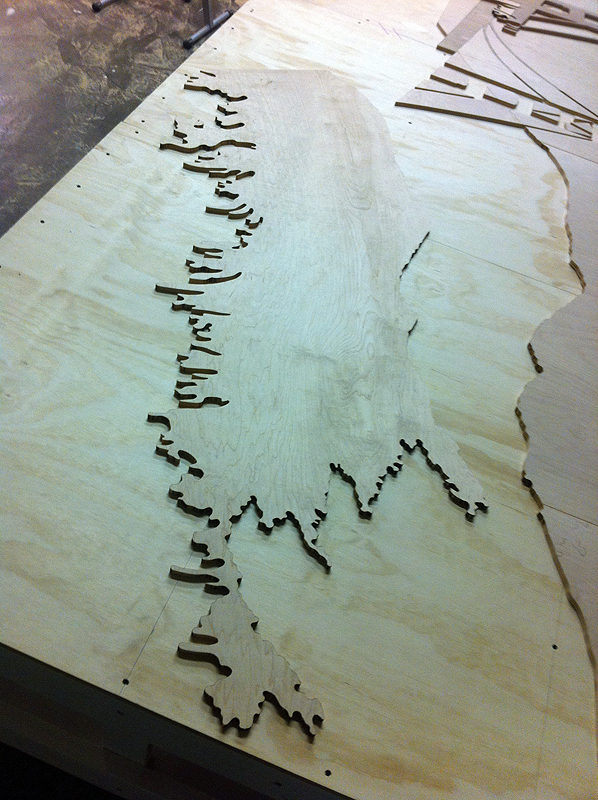 The hours spent leveling the structure in the studio and devising an attachment system paid off. 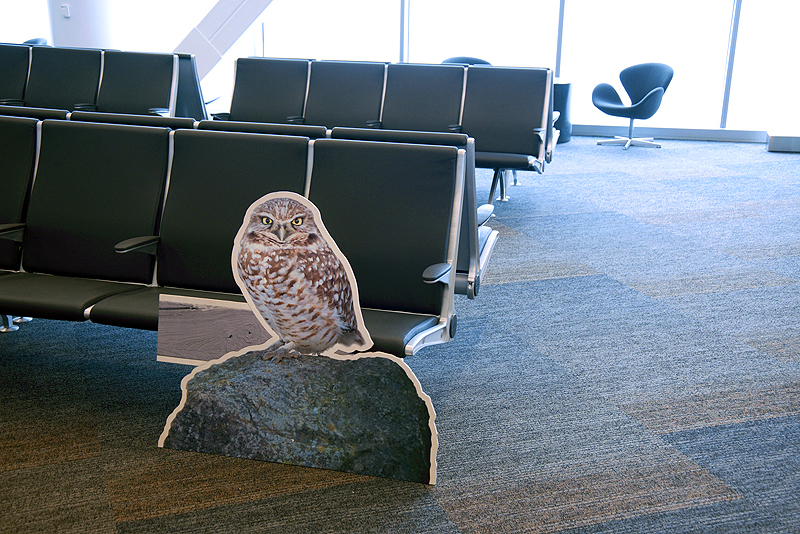 The Burrowing Owl was the secret to getting the mural installed. It was the cover of a secret hatch that allowed someone to go inside to secure the last section of the mural to the wall. I hope this look into the process has been interesting. 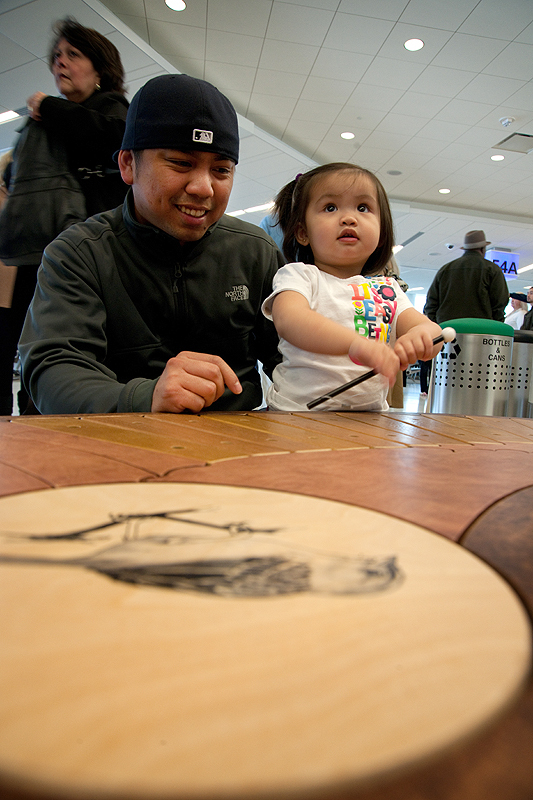 The grand opening was April 14th and the terminal is in full swing. 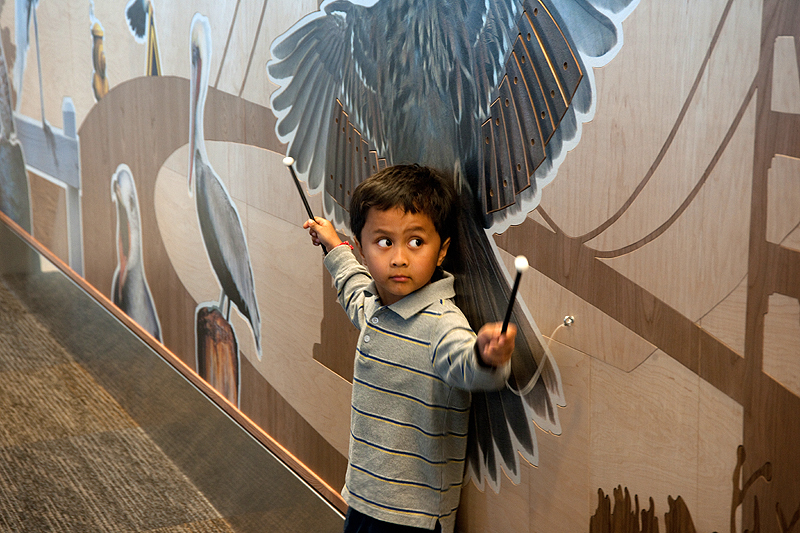 If you are ever flying to San Francisco and want to see the mural, book your flight on Virgin America or American Airlines since they are the only airlines in Terminal 2. The mural is dedicated to my late father and today is his birthday. It is a tough day but I’m trying to focus on all the good memories. 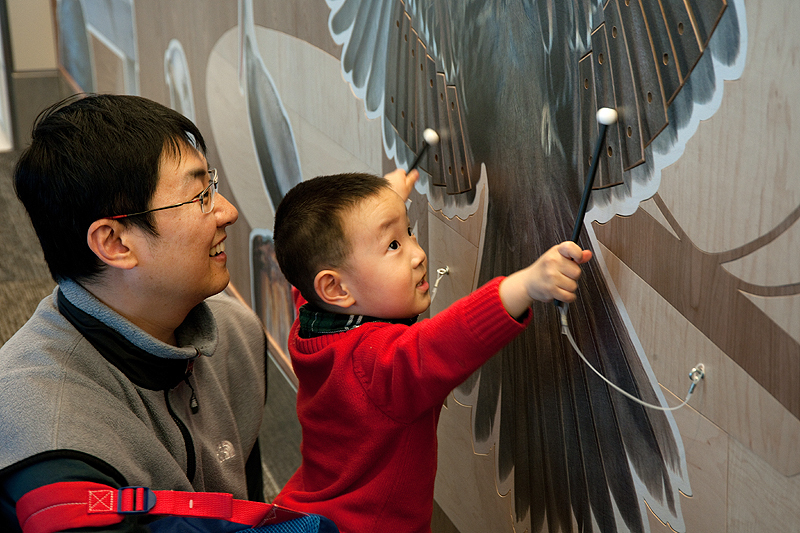 Thanks for tuning in to Bird Light Wind. Having the chance to share my images and experiences with you is one of my favorite things. 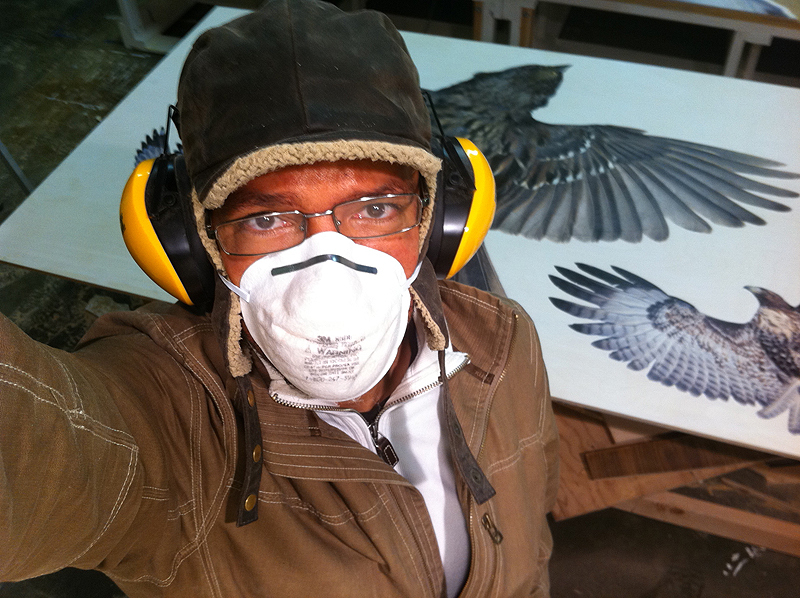 Work continued on the mural… hearing protection and a dust mask were important given the hours and hours I spent with a jig saw in my hand. 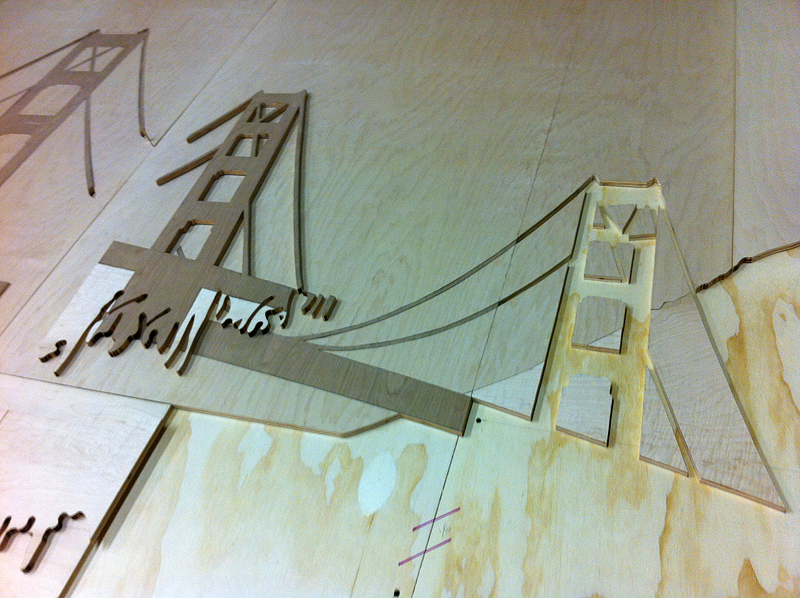 The inlay for the Golden Gate Bridge comes together. Fitting it into the grass background was a trick and the bridge came apart into more pieces than I expected. 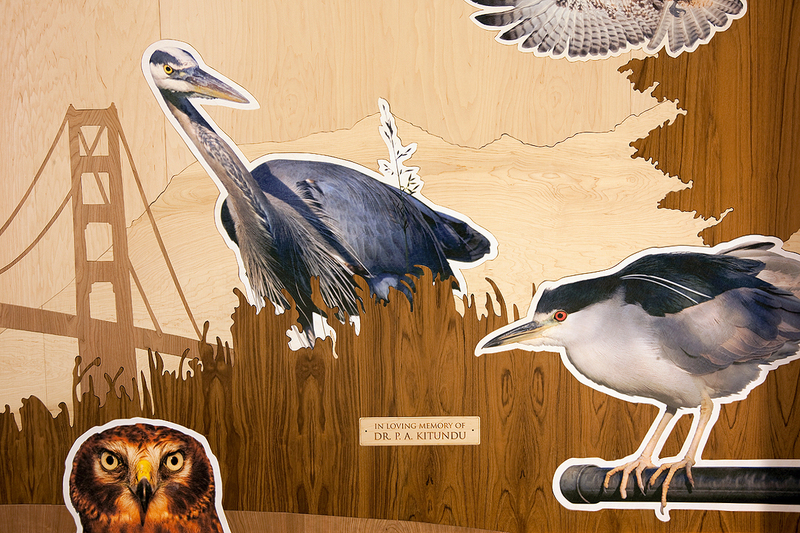 This was the most complicated single piece of the 150 inlaid parts in the mural. Meanwhile the benches were coming along nicely. It was good to take a break from one part of the project by working on the others. 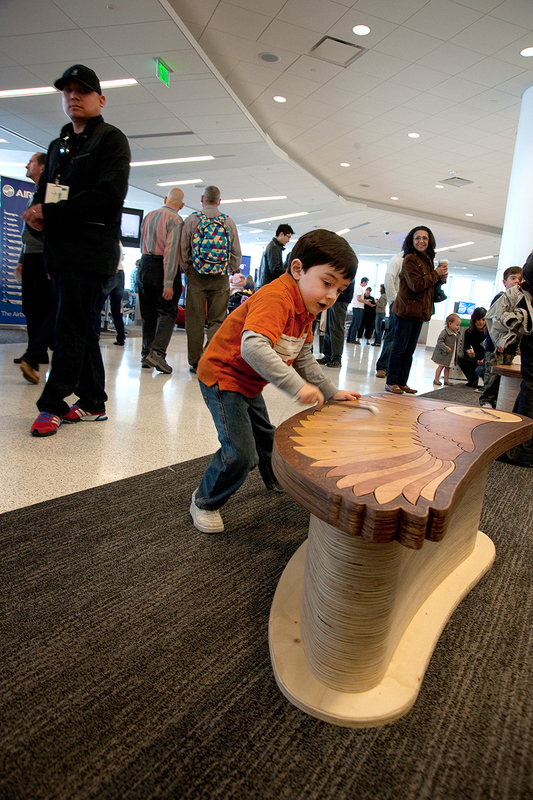 Above, a video of me testing the benches. I found out that adding the resonators, the recesses for which took me two days to build, made the instruments deafening so I had to leave them out. 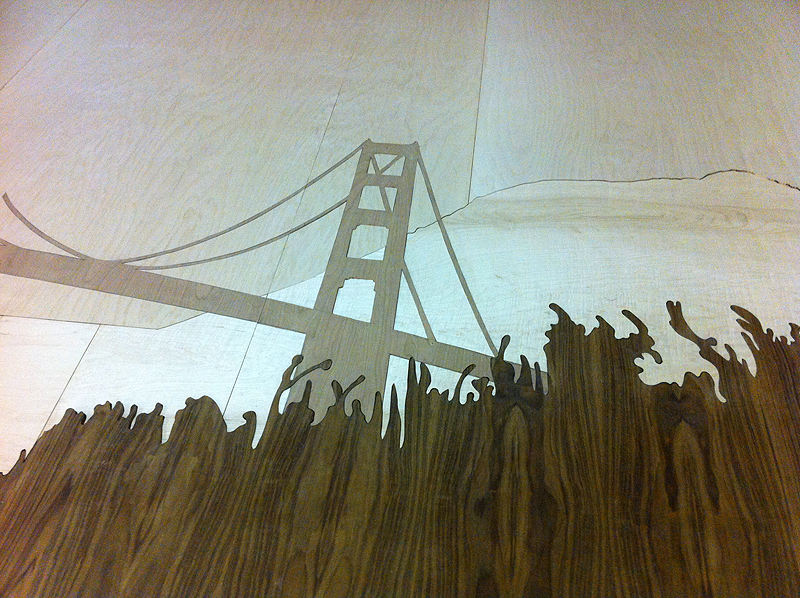 Another section of the background inlay coming together. It was nerve wracking cutting out the negatives because you just couldn’t mistakes on a pieces which already had hours of work invested in them. 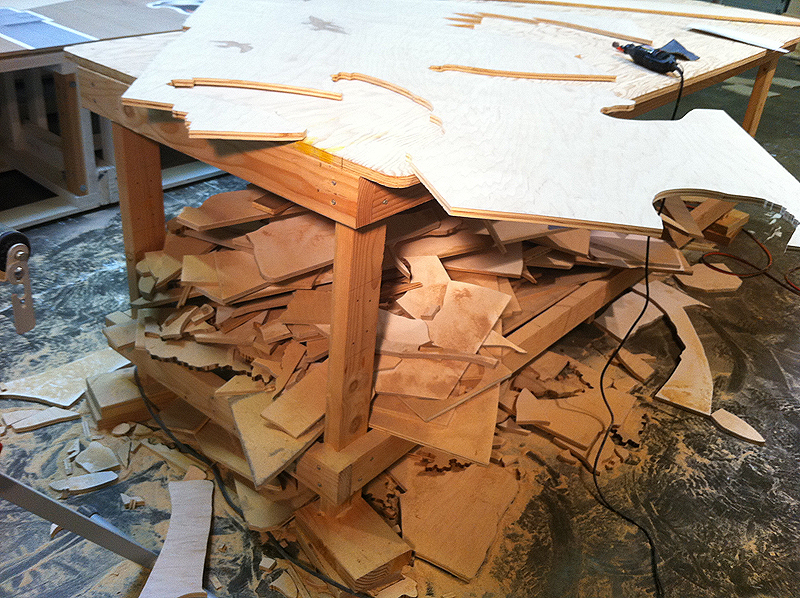 I started running out of room for the scraps generated by so much jig-sawing. 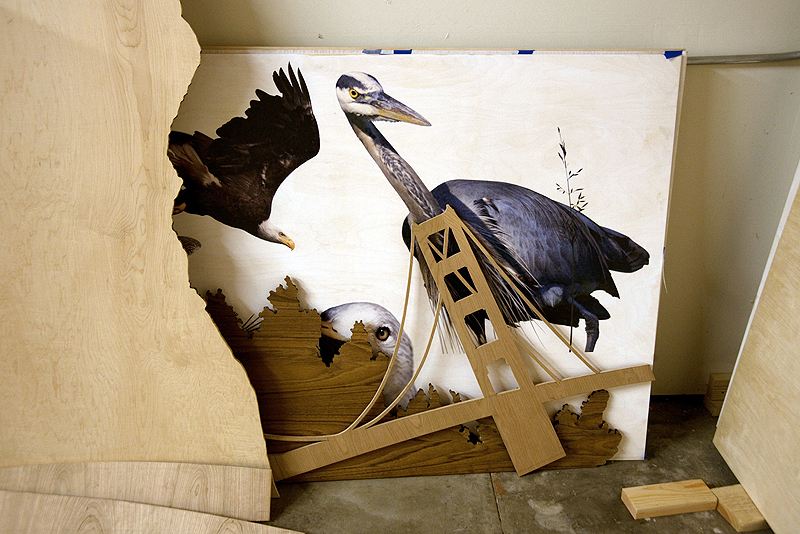 I started by gathering images and working with Magnolia Editions in West Oakland to print them onto plywood using their incredible flatbed printer. 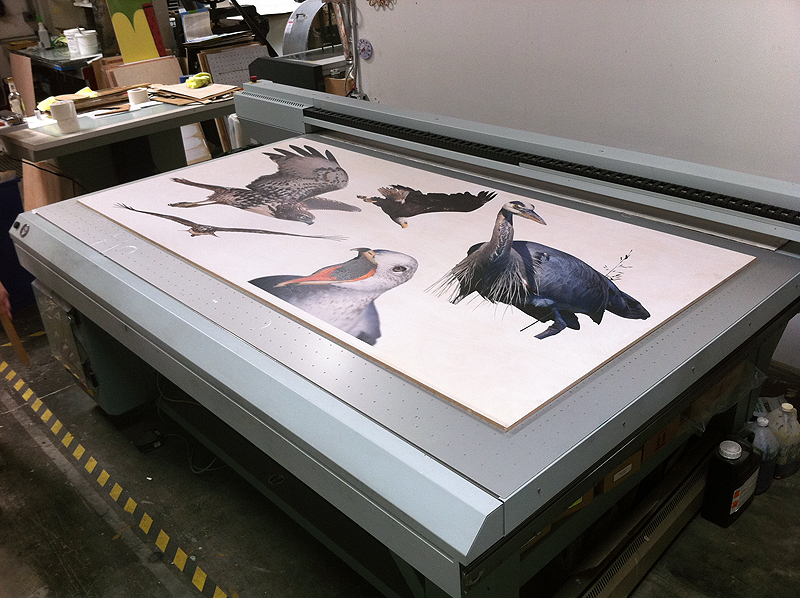 It can handle 4’x 8′ sheets and cures the ink with UV lights instantly. 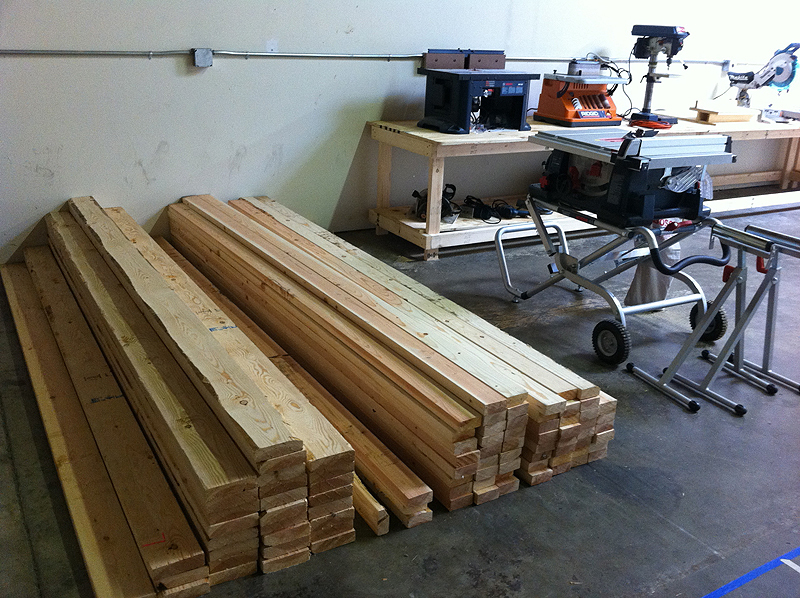 I also ordered and had the lumber delivered to a studio in Hayward that I rented specifically for the project. 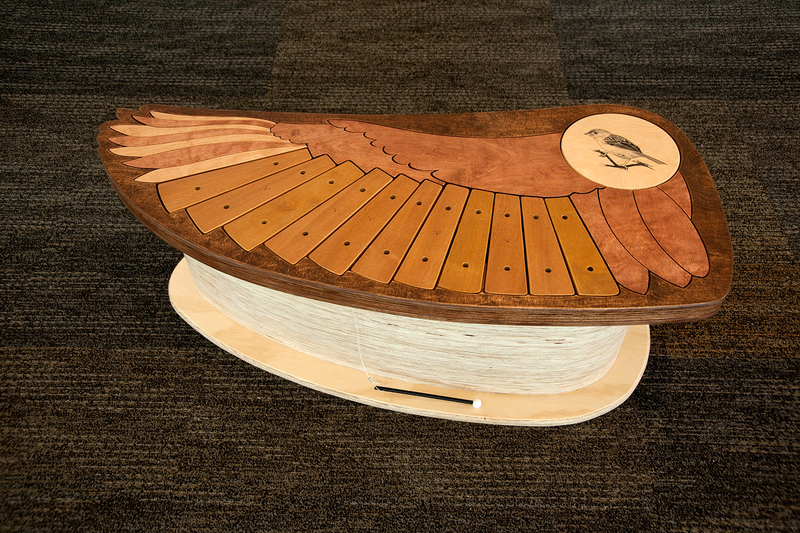 I had to build a structure to fit the mural into a recess and to accomodate the resonators I imagined would be necessary for the xylophone wings. 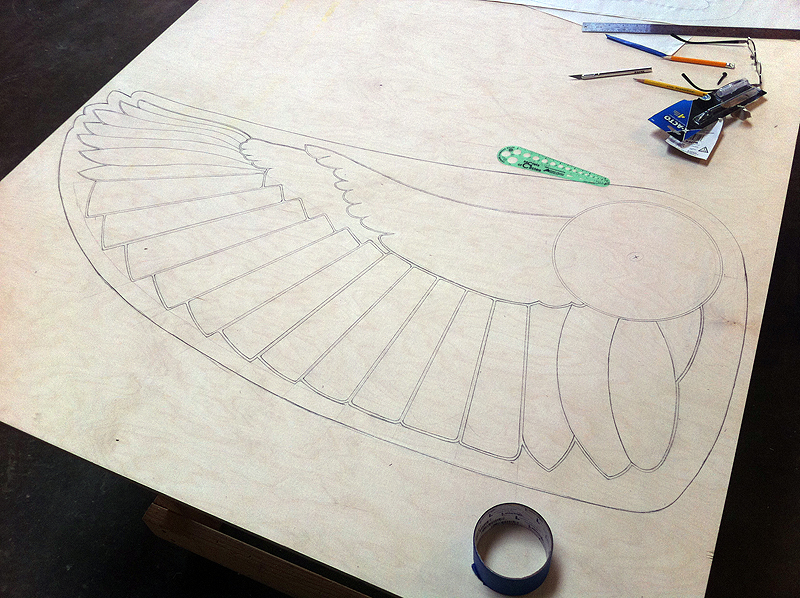 I had to start somewhere, so I drew directly onto the wood I planned to use as a template for the musical bird wing benches. This is the digital rendering I came up with for the mural. 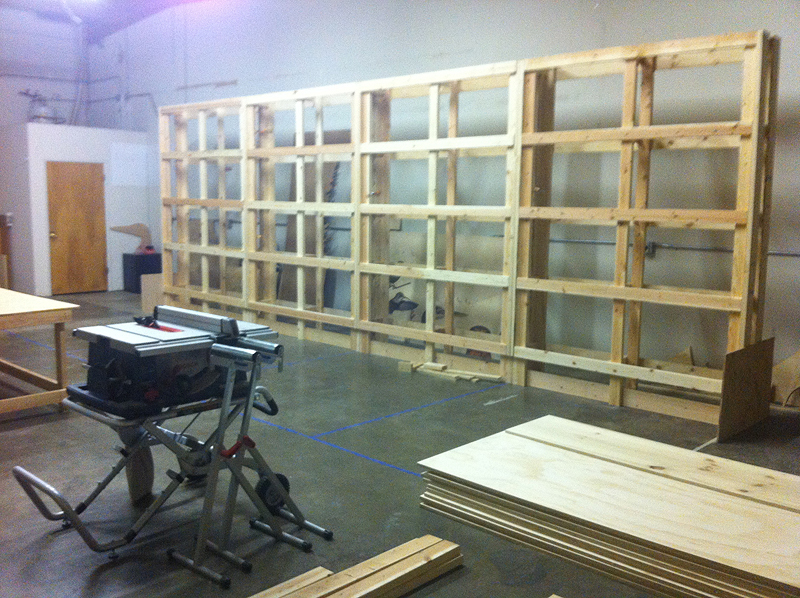 I like to improvise so it was tough to plan so rigorously, but the scale of this project demanded it. 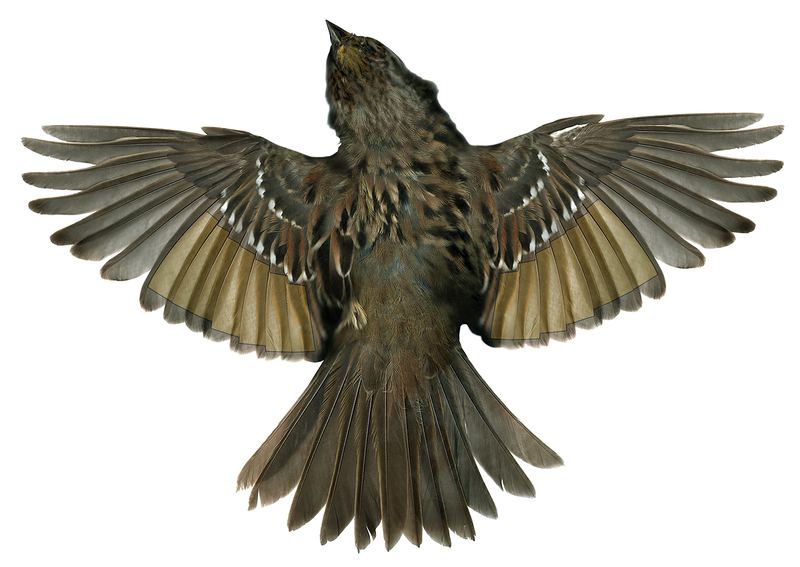 Here is the digital rendering of the Golden-crowned Sparrow with xylophone wings. The structure starts to take shape and I get a sense of just what I’ve gotten myself into. 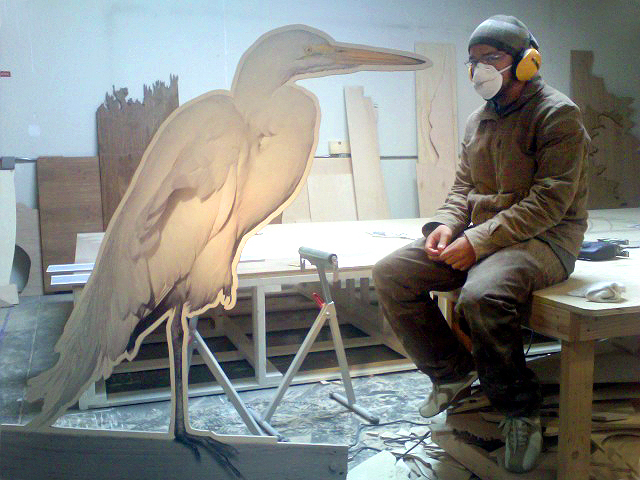 As I cut out birds and prepare sections of the background, the walls become strange collections of scrap wood and lurking birds. Working late into the night on the weekends down in an industrial park in Hayward, this Egret felt like my only companion. More to come tomorrow. 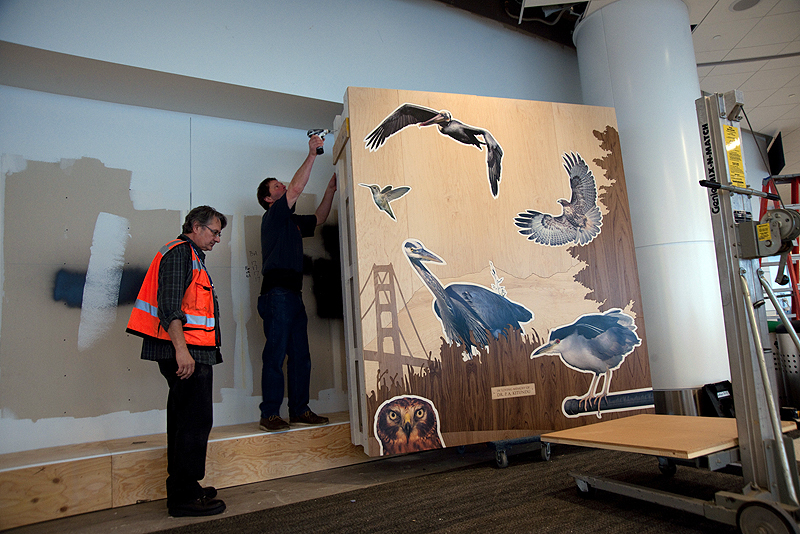 Last year I was commissioned by the San Francisco Arts Commission to create a mural for the new terminal at San Francisco International Airport. This is the result. 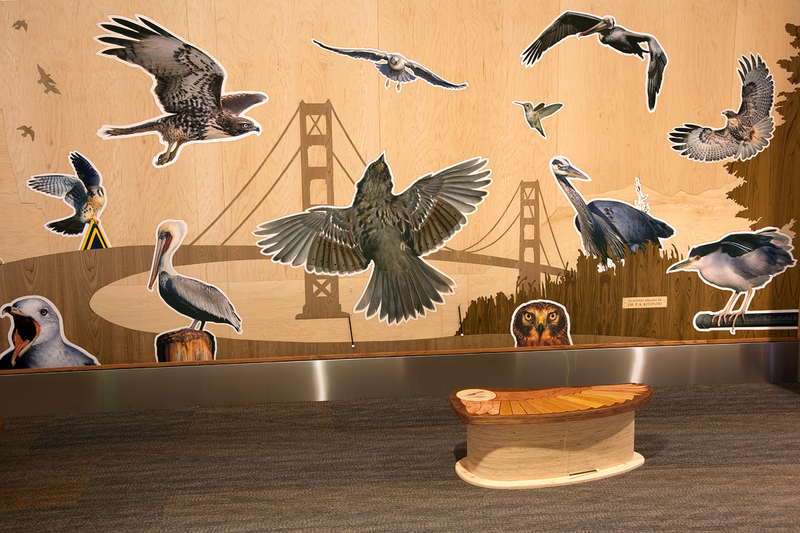 The images are birds I photographed in the Bay Area and they are printed onto wood, cut out by hand, and inlaid into the background, which is also all hand cut. The Golden-Crowned Sparrow in the center has playable wings. 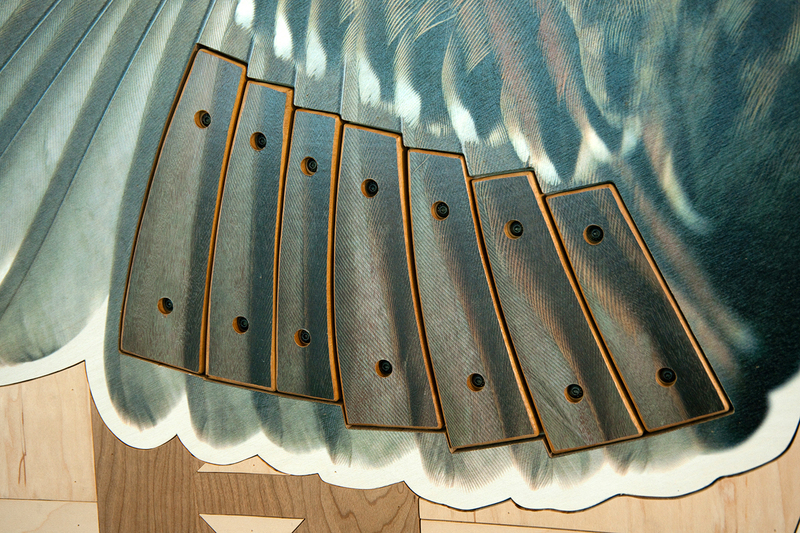 The secondaries are xylophone tines and are tuned to the notes in the Sparrow’s song. 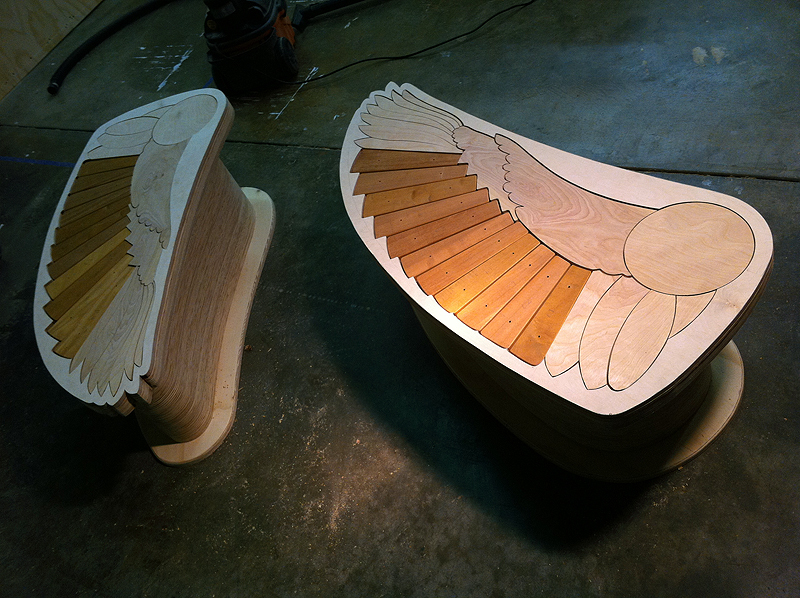 Here is a close-up of the wings. 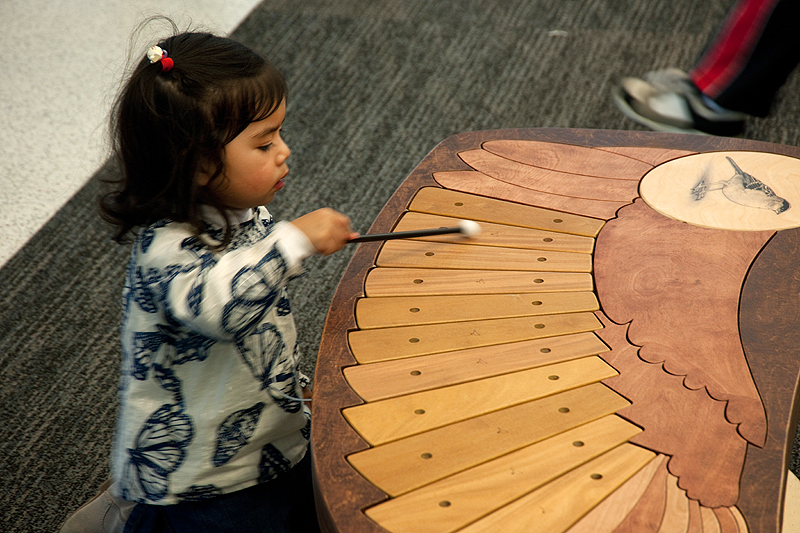 The benches are also xylophones and are tuned to the Sparrow’s song. You can actually sit on them too. Heartfelt thanks to Siobhan Ruck for her beautiful illustrations which adorn the two benches. The mural is dedicated to Dr. Peter A. Kitundu, my father, who passed away early this year while I was completing this artwork. 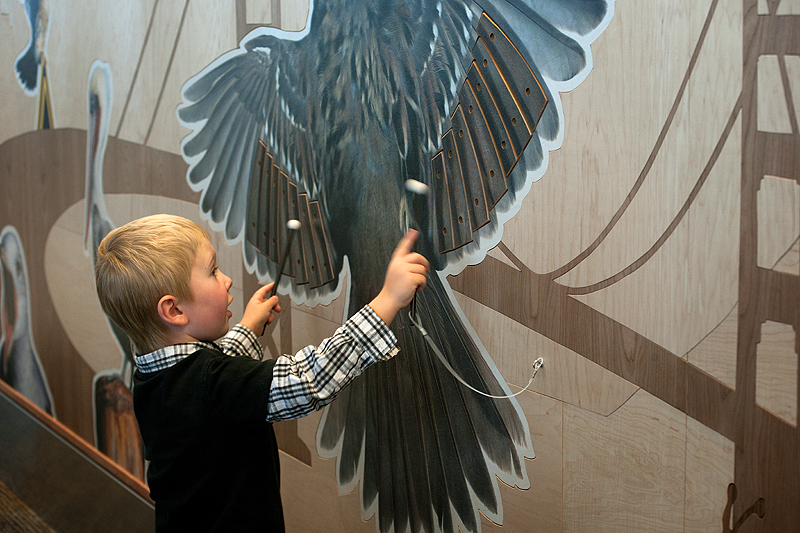 So the next few posts will give some insight into the process of making a musical bird mural by hand. It was exhausting and sometimes frightening, stressful, but also rewarding, and eventually very satisfying. I learned a great deal.